Rachmaninov’s four Symphonies - for what else is the Symphonic Dances but a Symphony in all but name? - span his whole career from student days to the end of his life and are now seen as important works in the development of the Symphony into the 20th century; it wasn’t always so. Ironically, it’s with the rehabilitation of the complete version of the 2nd Symphony – from about this time - that Rachmaninov’s symphonic fortunes have grown and blossomed. I’ll come back to this later. The history of the First Symphony is now well known; a disastrous première conducted by a, supposedly, drunk Glazunov, and a particularly unpleasant review by César Cui likening the music to the ten plagues of Egypt and suggesting that the inmates of a music conservatory in hell would admire it, gave the composer a three year creative block and bought about the destruction of the full score. Fortunately for us, whilst Rachmaninov may have thought he was covering his tracks by destroying the score, he forgot about the orchestral parts which were discovered in the Leningrad Conservatory of Music in 1943 and allowed for a new full score to be made and thus subsequent performances to be given. The Second Symphony was, for too long, performed in a cut version, which excised about a quarter of the score. I first heard, and got to know, this work from the Los Angeles Philharmonic/Alfred Wallenstein recording which I could never warm to as the work didn’t make any sense to me. Then, when I was about 13 years old, the Hallé Orchestra announced a performance of the work, conducted by Maurice Handford, in St George’s Hall, Bradford. I attended, thinking that hearing the work live might help my understanding of it, and was delighted to discover that it was the complete version which was to be given and on hearing this the music blossomed and spoke to me in a way it had never done before. In this Symphony, possibly more than in any of his other works, the sense of rest and movement is clearly defined and if bits are cut this delicate balance is lost. Nowadays, not only do we only hear the complete version but it is almost essential to make the music even more complete by repeating the exposition of the first movement: do that and the music makes even more sense. I well remember a superb, and musically logical, performance of the complete work (with exposition repeat) by the City of Birmingham Symphony Orchestra conducted by Bryden Thomson in St Alban’s Abbey in July 1987 – it makes one lament that this much under rated conductor never recorded the Rachmaninov symphonies. The Third Symphony, like the Fourth Piano Concerto, is the Cinderella of the set, but it’s now hard to see why. Obviously, the new classicism that Rachmaninov found in the 1920s wasn’t to the liking of his audience, which expected the big heroic tunes of the concertos, but, with hindsight, the music speaks easily and clearly to us. Even though the form is new to the composer - three movements with the slow second movement incorporating a scherzo - the fingerprint of the master is always in evidence. The Isle of the Dead was never a crowd-puller either! Poor Rachmaninov, his most thoughtful works ignored for so long! Here, however, the subject matter might have something to do with the neglect of this piece. The painting by Arnold Böcklin (1827-1901), on which this work is based, shows a ferryman rowing the dead to their last resting place. Is this meant to be Charon crossing the River Styx? It is said that the painting partly evokes the English Cemetery in Florence, where Maria, Böcklin’s baby daughter, was buried. The painting has quite a lot of light in it, not so Rachmaninov’s interpretation - neither has Reger’s musical depiction! However, as all Rachmaninov saw was a black and white copy of the original it seems likely that bleakness and the end of everything was what was conveyed to him. The Symphonic Dances was Rachmaninov’s last work and exists in two versions - for full orchestra or for two pianos – which were made simultaneously. Both are equally valid; when listening to the piano version you’re never wishing it had been orchestrated so perfect does it lay for the instruments, and at no time does the orchestral version sound as if it is piano music orchestrated. The first movement includes a part for saxophone - the only time Rachmaninov used the instrument. So concerned was he with his lack of knowledge of how it worked that he sought out the help and advice of Robert Russell Bennett to find out how to use the instrument. Bennett is best known as a Broadway orchestrator for, amongst others, Richard Rodgers, and a fine composer in his own right. Rachmaninov knew that this was the exact sound he had to have and as usual, his inner ear had hit on the correct sonority for the music, but without his knowledge of how to get it! Enough of history and reminiscences; what of these performances? I have long been a fan of Mariss Jansons, and his father, the much less well known Arvid. His work as chief conductor with the Oslo Philharmonic from 1979 to 2002 gave us many fine performances - I well remember a superb Honegger 3rd Symphony at the Proms in 1989. It had much more fire in its belly than this year’s Proms performance with his new orchestra. More recently he has led the Pittsburgh Symphony Orchestra (1996 to 2005) and now the Royal Concertgebouw. and Bavarian Radio Orchestras. With the latter he recently gave excellent performances of Britten’s Sea Interludes and Violin Concerto and Shostakovich’s 5th Symphony at the Bregenz Festival. He’s a conductor who slightly steps back from the music so as not to get between us and the composer and that is to be applauded although it has caused some to say that he is too detached in his music-making. Nothing could be further from the truth, and this set proves that he truly is the servant of the music he is performing. Jansons has this music in his blood and these performances are magnificent. Perhaps he doesn’t allow the First Symphony full rein and some of the youthful exuberance of it is missing. Nevertheless he holds the piece together and makes more musical sense of the finale than most. Again, some of his tempi might seem unusual but Jansons is always in control and makes them work within the context of the performance. Particularly impressive is the way he builds the climaxes in The Isle of the Dead, never allowing the tension to drop. If you want a complete set of Rachmaninov’s major orchestral works this is the one to get. The recorded sound is excellent. The engineers have captured the feeling of a concert hall with a good perspective on the full orchestra. The playing is superb; the solo woodwind being particularly good. I have only two small niggles. Firstly, why did EMI see fit to put the silly Scherzo (written by a 13 year old Rachmaninov) and the glorious Vocalise (given in the version for orchestra, not the usual arrangement for strings alone) on the CD after the Second Symphony? I don’t want to hear anything after the ending of that work and the Vocalise would have made a good preface for the Symphony. The Scherzo has no right to be in this set. Secondly, the gong. In the First Symphony and the Symphonic Dances there are important parts for the gong. Jansons holds it back all the time. The ending of the Dances is an important case in point. The final chord is underpinned by a blow on the gong. In some performances it is damped immediately; in others it is left to ring. conductor Vladimir Fedoseyev once told me, through a third party, that it could be played either way. 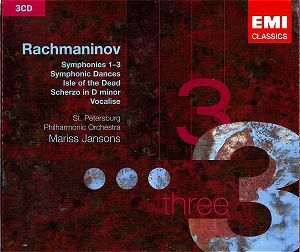 Surely, with the very nature of Rachmaninov’s final work being valedictory in so many ways, and with it culminating in the Dies Irae screaming out over the full orchestra on horns, the music including the decaying reverberation of the gong needs to resound into infinity and silence. But perhaps these are purely personal matters and they need not really bother the listener. All in all, there is only one word to describe this set: WOW!